Discover the never-ending benefits of vinyl fencing. When it comes to choosing the perfect fencing material, there are a wide range of materials to choose from for your home. Although, one of the most popular and sought-after materials on the market is vinyl. Many homeowners enjoy the low-maintenance and versatile qualities of the material. Discover why vinyl fencing is a popular choice among homeowners around the country. Vinyl fencing is one of the most durable and long-lasting materials on the market. Vinyl is about five times stronger than wood, so it can withstand all of the elements and everyday wear and tear well. You will never have to worry about high-speed winds or a snowstorm damaging your vinyl fence. Depending on how your care for your vinyl fence, it can last up to 20 years so you will never have to think about replacing your fence. Compared to all of the other fencing materials, vinyl is requires the least maintenance throughout the year. You will never have to worry about repairing water or insect damage to your fence. Cleaning a vinyl fence is incredibly simple and only needs to be cleaned occasionally throughout the year. All you have to do is rinse the structure with soap and water. 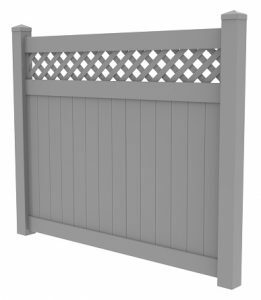 You will never have to paint and stain your fence, unlike wooden fencing. When planning to install a vinyl fence on your property, you have a wide range of styles, colors, and heights to choose for your whole family to enjoy. Regardless of which color you pick, it will last forever so you will never have to repaint your fence. You can choose from a variety of colors, so you have your fence blend in seamlessly with the rest of your landscape. Your fence can be any height you want, so you decide how private you want your property. This entry was posted on Friday, February 9th, 2018 at 3:56 pm. Both comments and pings are currently closed.